A New Hampshire company, Microgy Inc., is in the business of producing power using methane-rich biogas from cow manure, and already has a number of installations in place. It may sound a bit unusual, but dairy farms across the United States are now supplying power into the grid--through their cow manure.This past October, Environmental Power Corporation entered into a business development agreement with agricultural giant Cargill that will see Microgy Inc., a subsidiary of Environmental Power, and Cargill work together to identify opportunities for farmers to turn their waste products into bio-based energy and carbon offset credits--and share in the resulting revenue streams. Environmental Power, of Portsmouth, New Hampshire, is a developer, owner and operator of clean energy production facilities. Though this Microgy-Cargill agreement was signed this past fall, Microgy already has a number of manure-to-power facilities in place in the U.S. dairy industry. And it is one of those rare examples of a win-win situation. It helps the dairies to manage their manure and brings power on to the grid. The owners of Five Star Dairy in Wisconsin made it known five years ago--as the dairy was being built--that they were interested in proposals that could be put before the local utility to use anaerobic digestion of manure to produce biogas to generate electrical power. They could see the writing on the wall regarding how large, intensive livestock operations would be required to manage their manure in future. To some extent, legislative changes have occurred since then. The Environmental Protection Agency (EPA) promulgated new rules in 2002 regarding manure management by large animal feeding operations, and many states have also taken legislative action to regulate manure management. The Five Star Dairy is located near Elk Mound, Wisconsin and was built in 2000. It is owned by Lee Jensen, his wife, Dr. Jean Amundson, and Lee's cousin, Jim Jensen. The dairy consists of 900 milking cows producing milk in two parlor barns. About 25,000 gallons of manure is generated per day. Each barn has a four-foot wide, four-foot deep manure collection pit, and the pits flow together into a belowground holding tank. "Our system of manure collection is ideal for the anaerobic digester because it is all coming from one place," says Lee Jensen. The manure generated by Five Star Dairy is the feedstock that Microgy Inc. is using to introduce proven Danish anaerobic digestion technology into the United States. The primary purpose: producing high volumes of methane-rich biogas. The 60 to 65 percent methane in the biogas is being used as fuel to power a Waukesha engine that is connected to a 775 kW generator, which in turn is tied into the local power grid. The anaerobic digester on the Five Star Dairy produces methane-rich biogas used as fuel to power an engine connected to a 775 kW generator, which is tied into the local power grid. There's plenty of manure on the farm to be used in the anaerobic digester system: The dairy's 900 milking cows produce about 25,000 gallons of manure every day. Jensen says there were many reasons why the dairy actively pursued an anaerobic digestion system for its operations. The most obvious reasons were odor reduction and reduced need for field application of manure from the dairy's lagoon. The presence of manure solids in the lagoon has been greatly reduced due to their use in the anaerobic digestion and separation processes. Therefore, lagoon agitation is greatly reduced, as is consumption of fuel to operate the agitation pump. Secondly, the largely pathogen and weed-free solids that the dairy is separating out after they are processed in the digester are being re-used for bedding for the dairy cows, compost and fertilizer on some of the dairy's 2,500 acres of cropland, as well as being sold to other area dairy farms. Re-using the treated solids as bedding saves the dairy about $2,000 per month, and the material can be recycled over and over again through the anaerobic digestion and separation system. Since solids no longer accumulate in the dairy's lagoon, Jensen feels they can safely use the lagoon liquid to irrigate nearby hayfields. Other dairy operations in the state are following this practice, claiming to be getting phenomenal crop yields. In addition to providing a natural source of nutrients to hay crops, using the lagoon liquid in this manner also saves the dairy farm from having to dispose of about 100 semi-trailer truck loads of lagoon effluent annually. This was typically required because of the crust of solids and rainfall that used to accumulate in the lagoon. "Now we can use that rainfall accumulation to our advantage rather than it being a cost item," says Jensen. In the not too distant future, Jensen says the dairy may install a water treatment system so that it can recycle a portion of the water for use in the barns, thus providing additional savings in water hauling and fuel consumption costs. Given the amount of biogas being generated by the anaerobic digester, Jensen says the dairy is obviously hoping that this part of the operation will develop into a profit center. Another benefit the dairy hopes to capitalize on is capturing more of the radiant and exhaust waste heat produced by the gas engine to provide heat to the dairy barns and potentially provide heat to other business ventures that can be attached to the dairy farm at some future date. At present, a portion of the heat is being used in the anaerobic digestion process. 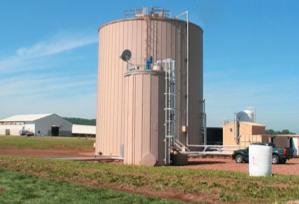 Five Star Dairy chose Microgy as its anaerobic digestion system provider because of an agreement Microgy negotiated with the local utility, Dairyland Power Cooperative, to install biogas generating digesters on five animal feeding operations within the Dairyland power distribution area. Microgy acted as the general contractor on the Elk Mound project, designing and building the anaerobic digester system, which it is selling to the farm, and a power generator, which it is selling to Dairyland. Microgy provided the construction financing for the digester portion of the project, with the financing paid back by the dairy farm through the sale of the biogas. Microgy anticipates that the biogas generated by the Five Star Dairy anaerobic digester will help generate 6.5 million kilowatt hours annually, an output sufficient to supply approximately 600 homes. What's unique about its proprietary Danish technology is that it uses a combined feedstock of animal manure and substrates like fats, oils, and proteins derived from food industry wastes, in a special formula to boost methane production. This system was developed over the past 17 years by a private company in Denmark that currently has 30 similar plants operating throughout Europe. "Our Danish partner approached anaerobic digestion from the perspective of focusing on maximizing gas production," says Albert Morales, executive vice-president of Environmental Power. 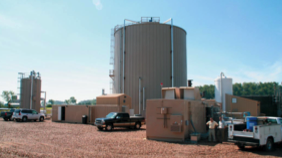 "Many other digesters are focused on the waste management issue while producing some gas. From a practical perspective, what this means is that this system can pay for itself through the sale of energy produced from the gas. My understanding is that our system produces significantly greater amounts of biogas than other systems out there." Jensen says, in terms of cost, the Microgy system was more expensive up front, but he anticipates that the payback will be faster than other systems available on the market. He estimates that the Five Star Dairy system will pay for itself in nine years. Anaerobic digestion is a naturally occurring process in which microbes break down organic material into inorganic compounds in an environment devoid of molecular oxygen. Under the Microgy system, a combination of manure and substrates are heated to 130 degrees F. and continually agitated in an above ground tank for 21 days to maintain a healthy and highly productive microbial environment. Biogas is siphoned off from the top of the tank. A nearly pathogen and weed-free slurry exits the bottom of the tank and is transported to a liquid and solid separator. Morales says the basic system is designed for a 1,000-cow operation. It also works using manure generated by other types of animals.Jensen says the dairy chose to sign a maintenance agreement with Microgy to look after the day-to-day operation of the digester, which was negotiated when the contract was signed. He says the cost was reasonable, and the dairy has the option of becoming more involved in its operation. Morales says it is Microgy's intention to operate all its installations. The systems are equipped with many monitoring and control devices that can be adjusted remotely. "Our engineers can look inside the entire system and see every pump and every valve, as well as monitor and make changes to the temperature of gas production from a remote location," says Morales. Microgy has also hired a local technician to visit each site as deemed necessary. In addition to providing a proper manure collection system at the front end to meet Microgy's needs, Five Star Dairy also installed its own separation system at the outfeed. It located the separator, in a building about 100 yards from the digester, next to the dairy lagoon. The slurry exiting the digester tank gravity flows through an underground pipe to the separator, where the liquid and solid streams are separated. The liquid stream gravity flows from the separator into the lagoon, while the solid material collects in a pile where it remains in storage or is used immediately for bedding. Solids exiting the separator consist of 40 percent dry matter and 60 percent moisture. Up to two-thirds of the solids are used for bedding, while the remaining third is sold as bedding to other dairy farms, as compost, or used on cropland as fertilizer. The U.S. government provided Five Star Dairy with an $180,000 grant through its Renewable Energy Systems Energy Efficiency Improvements program. It was one of the 167 recipients from 26 states to share in the $22.8 million offered by the United States Department of Agriculture under the program. Former U.S. Secretary of Agriculture, Ann Veneman, also visited the dairy while the project was under construction. Jensen says the project has attracted interest from both rural and urban residents living in the area. "It's been a very positive thing for the farm," he says. "Getting the digester up and running was kind of the first step. Looking ahead, I believe that there will be add-ons." Besides using manure to generate electrical power through a digester producing biogas--as with the Five Star Dairy project--there are other types of power and fuel from manure projects being ramped up in the U.S. Panda Ethanol Inc. has started construction of a 100 million gallon-per year ethanol plant in Hereford, Texas. When finished, the first-of-its-kind facility will be one of the most energy efficient ethanol refineries in the nation and the largest biomass fueled ethanol plant in the United States, according to the company. Unlike other plants which burn natural gas or coal to generate the steam used in the ethanol manufacturing process, the Hereford facility will gasify up to one billion pounds of cattle manure per year. By using biogas to fuel the plant, Panda is both conserving the energy equivalent of 1,000 barrels of oil a day and helping to address a significant environmental problem for the Texas Panhandle region. Hereford, which bills itself as the "Beef Capital of the World," boasts 3.5 million head of cattle within a 100 mile radius. Panda officials have dubbed it the "Saudi Arabia of cattle manure," as each steer produces approximately two thousand pounds of organic waste a year. As the waste material decomposes, it emits methane, a potent greenhouse gas that many believe contributes to global warming. Panda's Hereford facility will dispose of the waste product by utilizing a bubbling fluidized-bed gasifier. The gasifier will thermally decompose the organic material in a multi-phase process. The result is a clean, odor-free conversion of the material into the steam necessary to process corn into ethanol. The turnkey contractor for the ethanol process and all construction of the Hereford facility is Lurgi PSI Inc. of Memphis, Tennessee. Energy Products of Idaho is providing the manure handling and gasification systems. The total construction cost of the Hereford plant is approximately $186 million. Panda expects ethanol production to commence in the second half of 2007.